Ever since I met Trevor van Gorp at the 6th International Conference on Design & Emotion in Gothenburg, Sweden, I knew he was passionate about this topic. Now he co-authored (alongside Edie Adams of Microsoft) a brand new book “Design for Emotion” to share his passion with the world. The book provides a very nice overview of the theory, psychology and concepts behind ‘design for emotion’. I highly recommend it, especially for professionals that haven’t studied this topic too much yet. 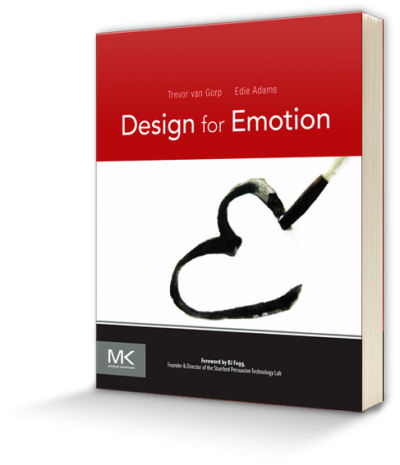 The book offers a rich amount of background information and examples that will help you to better understand the concept of emotional design. Furthermore Van Gorp & Adams illustrate their framework A.C.T. to put ’emotional design’ into practice. I am also very happy to have contributed to the book with an interview on the LEMtool. 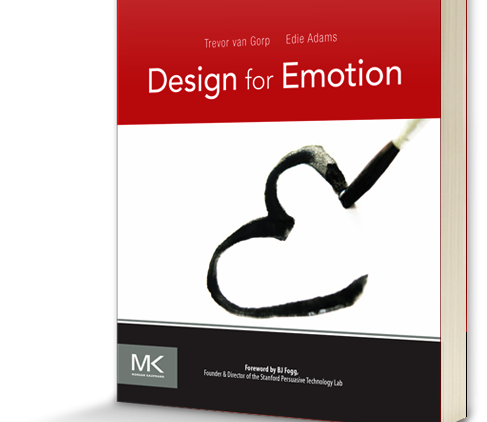 After seven years of research and almost one and a half years of writing, Iâ€™m very pleased to announce that the book Iâ€™ve co-authored with Microsoftâ€™s Edie Adams on designing for emotion and personality is available on Amazon. Drawing on our combined experience of over 30 years in graphic, interactive and industrial design, human factors, and product management, Design for Emotion explores the what, when, where, why and how of designing emotion and personality. We define and model emotion and personality in a way that relates directly to design practice.